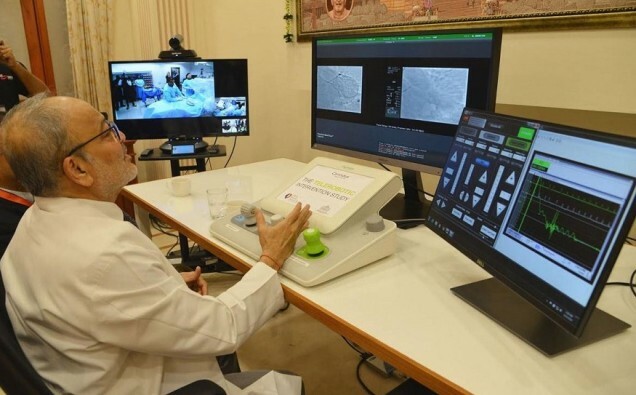 India has achieved an important breakthrough in the history of medical science with the World’s First-in-Human Telerobotic Coronary Intervention by Dr. Tejas Patel, Chairman and Chief Interventional Cardiologist of the Apex Heart Institute at Ahmedabad. This is the world’s First Percutaneous Coronary Intervention (PCI) conducted from a remote location outside of the catherization lab. The operation was performed from Swaminarayan Akshardham temple, located at a distance of roughly 32 km from catherization lab of the Apex Heart Institute in Ahmedabad, where the patient was admitted and attended to by Dr. Sanjay Shah. The success of this study paves the way for large-scale, long-distance telerobotic platforms across the globe. Cardiovascular disease, including stroke, are the number one causes of death worldwide resulting in nearly 18 million deaths per year. Geographic barriers, socioeconomic status and a rapidly shrinking number of skilled specialists significantly hinders patient access to timely, specialized cardiovascular care. This is especially of concern during highly emergent medical events, such as heart attacks and stroke, where ideal treatment must be received in as little as 90 minutes or within 24 hours, respectively, to avoid death or permanent disability.